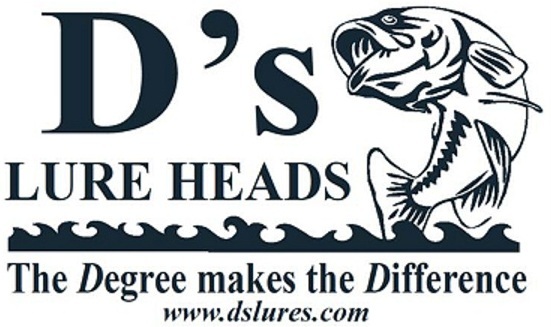 D's Lures Award: A 7.71 bag of fish won Michael Kaser and Kyle Kaser a package worth over $100. 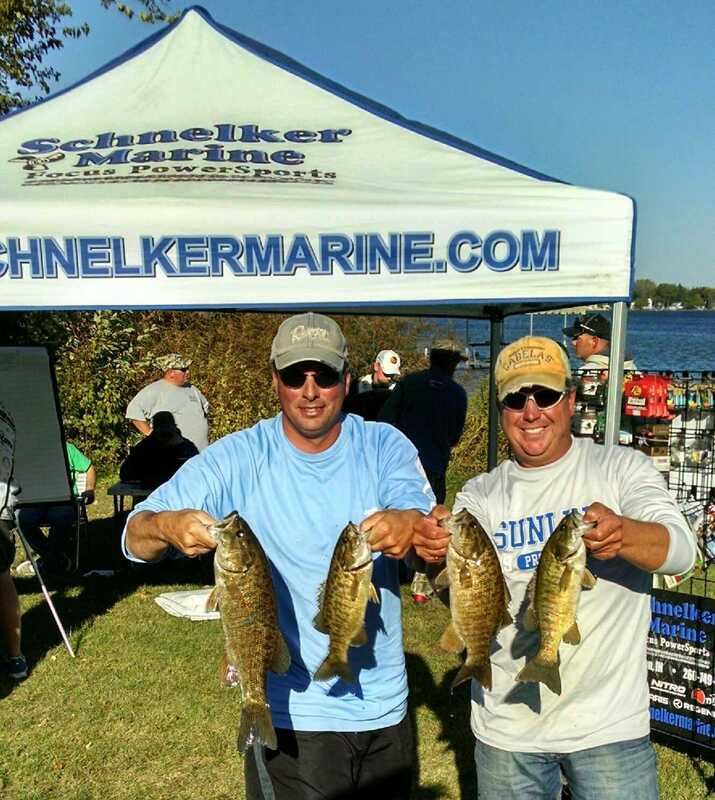 Solar Bat Sunglasses Incentive: Finishing in 20th place with 3.16 pounds, Rick Thatcher and Matt Kiefer qualified for the Solar Bat Incentive worth $100 in cash. 1st Place: Not only has no reigning Season Champion ever won the Classic tournament, but not one Season Champion has even finished in the money at the Classic before now. Let it be heard: we have officially entered the John Gipson, Jr. and Tom Noe era. R & B members take notice. Early on October 11, Tom Noe even called his shot, "We're already getting paid today ($400 for winning the season), so we're going for big ones. You won't find a spinning rod on our deck," he said with a smile and laugh. The gameplan was laid the week before in practice. Noe acknowledged, “I don’t like clear water very much, so I got out of Coldwater and found something working well on Marble.” That “something” was a combination of jigs and drop shot rigs in deep water. Click here to view the results on a PDF file. However, despite the confidence and practice, the champions found their livewells empty halfway through the tournament. It was not until noon when they landed their first keeper, which was also their first fish. “We were scrambling!” Noe admitted. That fish came shallow tricked on a jig. Like great anglers, they took one clue and used it to fulfill their mission. Over the next four hours they would land nine more keepers to finish with a 13.61 pound limit, which included the second biggest bass of the tournament (a 4.8 pound toad), to bring home the plaques, $2,000 for the victory, $250 for the big fish, and $600 of merchandise from Bass Pro Shops. the bulk of their fish with drop shot rigs and jigs in water between 12-17 feet deep, but they had to be retrieved “painfully” slow. Once they put this together they were able to rotate through their best areas with success. Noe added, “The areas with the wind blowing in on them were the best.” Several fish were caught after being spotted on their graph. The big bass of the day came from five feet of water in an isolated weed clump off a jig. Colors of choice for jigs were green pumpkin with gold flake, while the drop shot rig was paired up with minnow style baits. 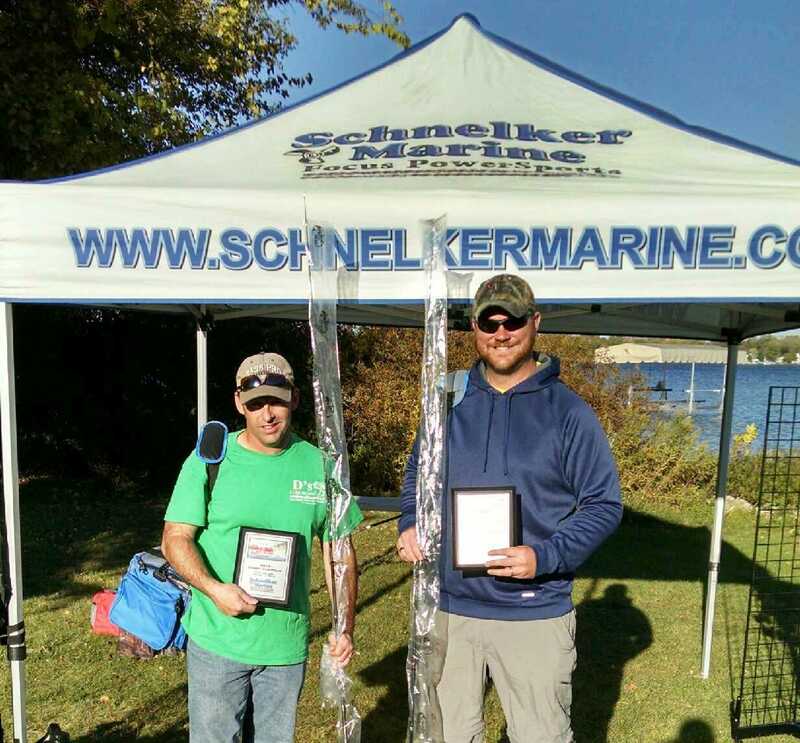 2nd Place: Like the winners, though on the opposite end of the chain of lakes, John DuPont and Steve Januchowski had empty livewells until noon. “We determined then that the conditions were right for a jerkbait out on the mainlake,” recalled DuPont, “so we decided to commit to it.” Over the next four hours they would land 10 keepers with their best five weighing 13.29 pounds to score $1,000 and $600 of merchandise from Bass Pro Shops. All of their fish came from a single 150 yard stretch of breakline along a mainlake hump on Coldwater Lake. “We positioned our boat on the breakline and cast parallel to it. Fish came anywhere between two to six feet deep,” admitted DuPont. The most successful bait was a Lucky Craft Flash Pointer 100 in the ghost gill color scheme. Their bag of fish was a mix of largemouth and smallmouth, and biggest fish, weighing 3.78 pounds, came on the last cast of the day. “We were already packing up when Steve landed it,” DuPont confessed. 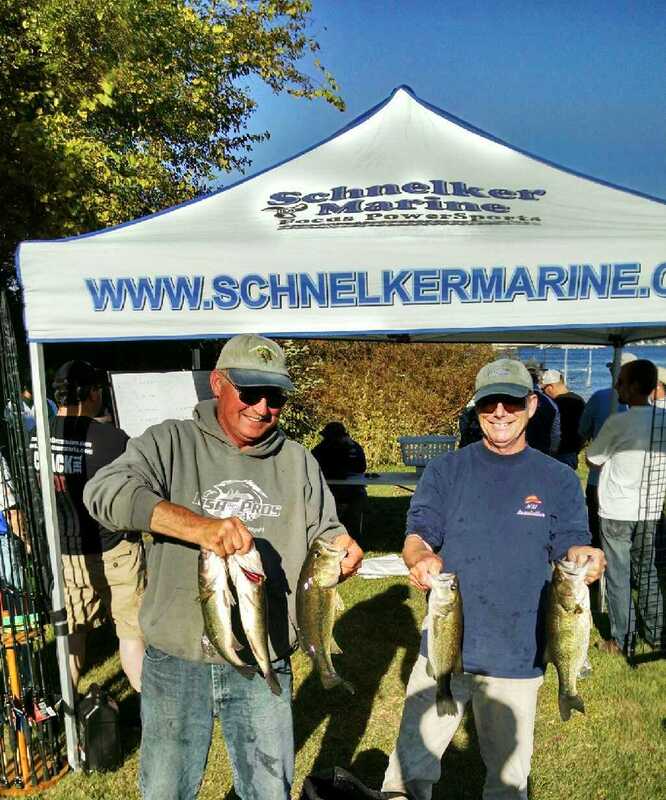 3rd Place: For the 2015 season Ray Smith and Art Kerns saved their best for last. 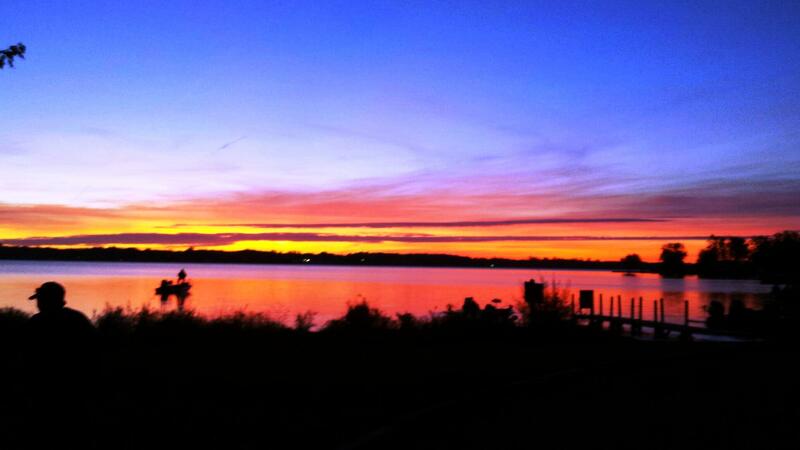 They scored their second consecutive top 5 finish after doing so at Muskegon Lake as well. 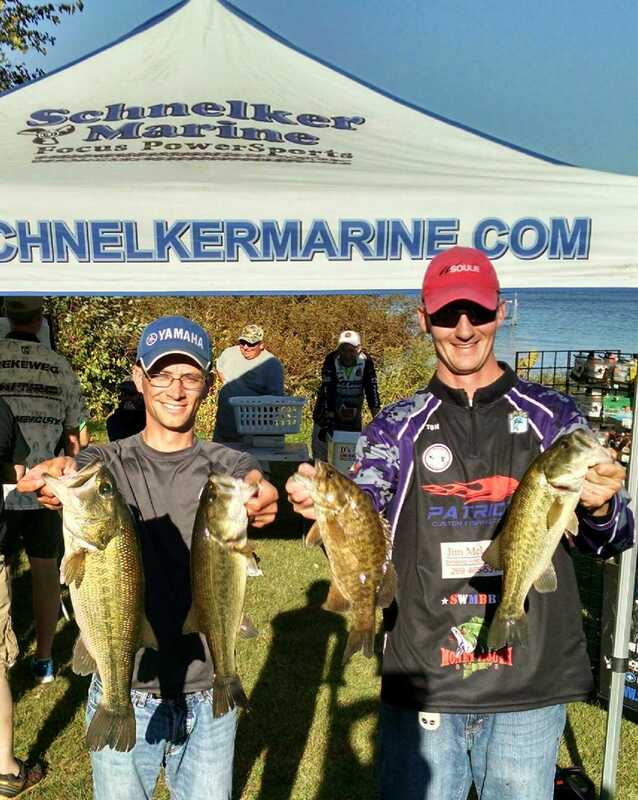 By skipping docks and piers on Coldwater Lake all day, they put together a 12.86 pound limit to win $800, which was anchored by a 4.59 pound hawg. “We began searching for some schooling fish,” admits Smith, “but after an hour we had nothing to show for it, so we went shallow.” Their first keeper of the day was also their big fish, a 4.59 pound largemouth, “I had just cast under this pier,” recalled Smith, “when Art cast under it and got it to bite.” This put them at ease and set the tone for the remainder of the day. They went on to land 13 keepers total on a bite that stayed consistent all day. Every fish was caught with a jig. 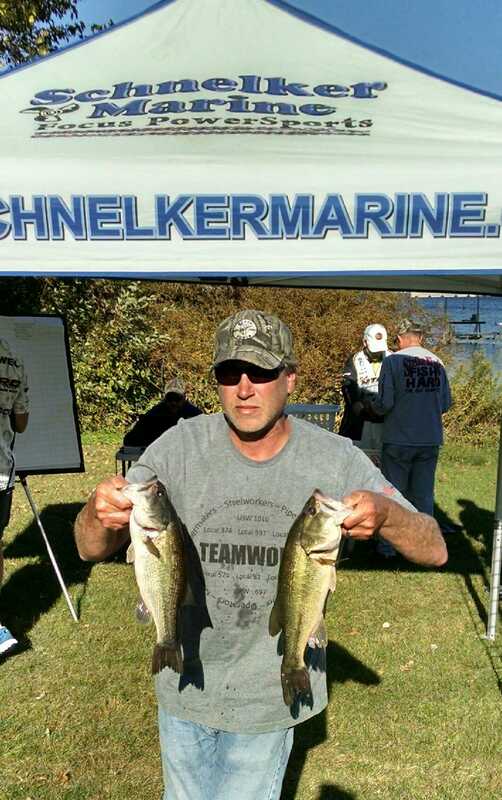 4th Place: Despite fishing solo against Michiana’s finest, Jim Wheeler still managed a top 5 finish. His 10.52 pound limit won him $700. All of his fish came from a series of channels known as Shawnee Shoals. “I went out the week before to practice, and never caught a fish there, but it just looked too good not to hold some fish,” he said. 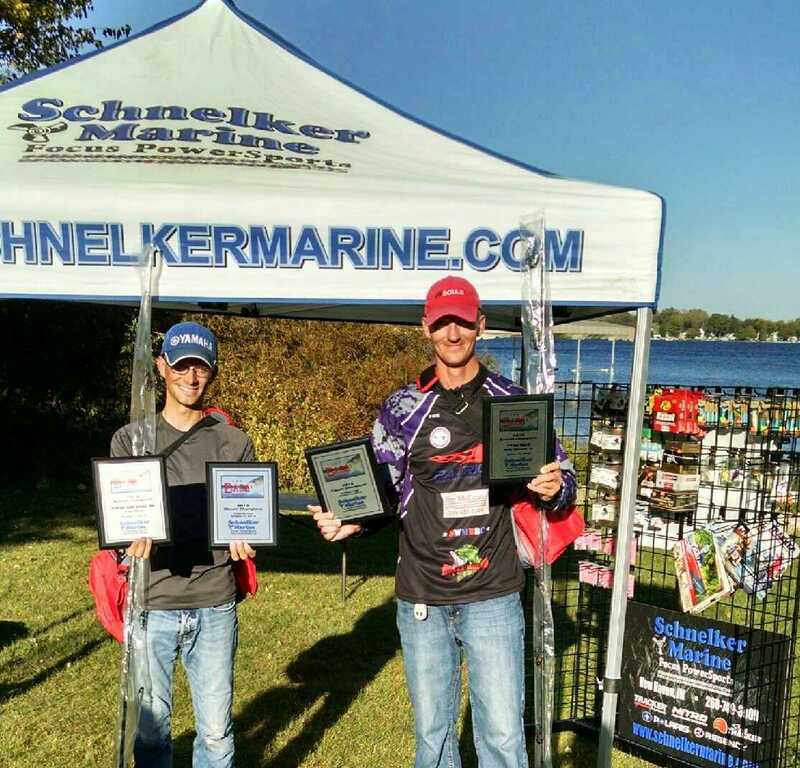 After beginning the tournament on Long Lake without any immediate success he went to Shawnee and got to work. By 10:30 he had his limit. “All of my fish came from two baits: a shad colored spinnerbait and black jigs. The fish were scattered and not relating to anything specific.” He would land 9 keepers total. 5th Place: Scoring their first top 5 of the season, heavy favorites Greg Mangus and Kevin Fletcher brought 9.73 pounds to the scales to claim $550. But it was not an easy task. 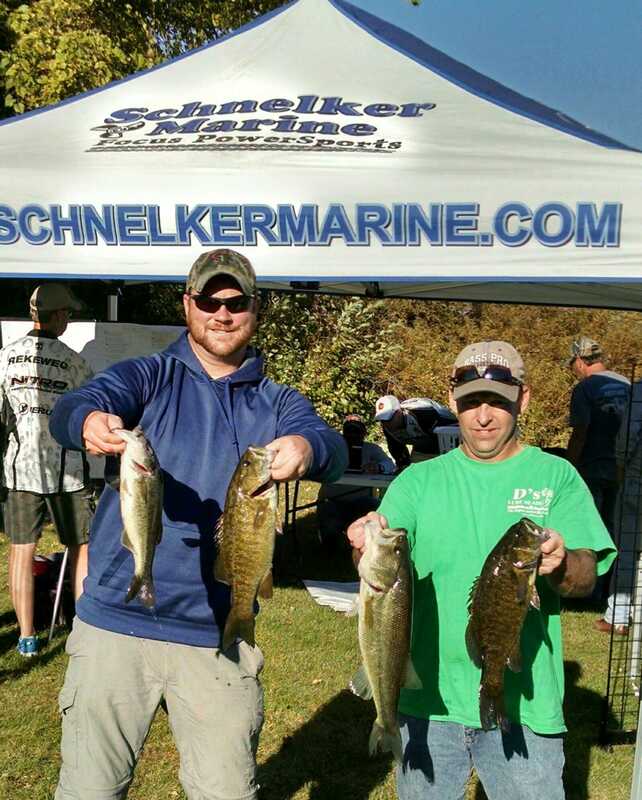 6th Place: The 2011 and 2014 Classic Champions, Jason Dittmar and Tony Kaser (right), came through with an 8.84 pound limit to win $500. 7th Place: The 2013 Classic ChampionsRon Fabiszak and Ron Nelson (left) brought 8.50 pounds to the scales to take home $450. 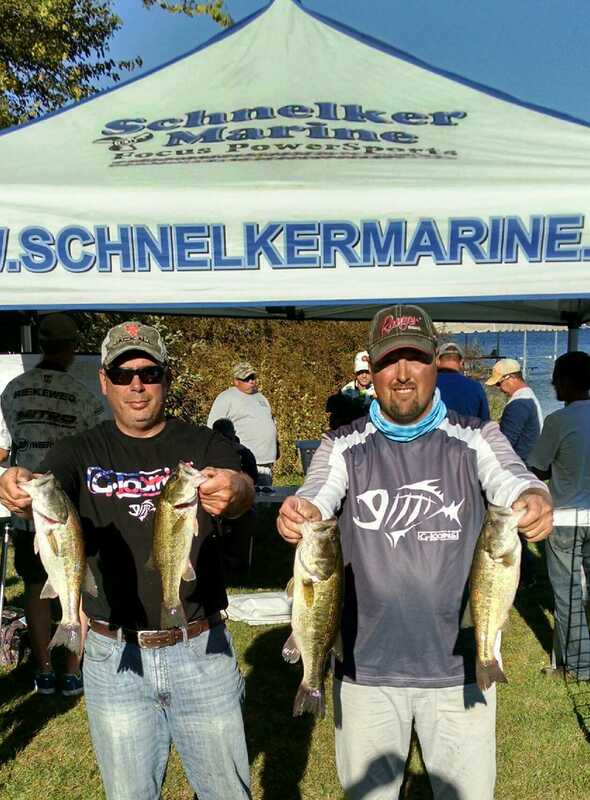 8th Place:Kevin and Kelly Warner caught 7.99 pounds to win $350. 9th Place:Larry Stanley and Dave Terry's 7.86 pounds was good enough to win $300. 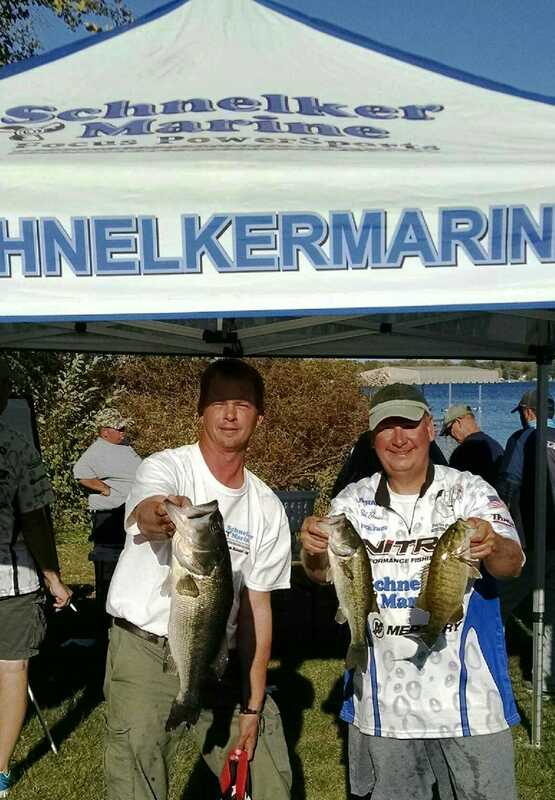 10th Place: The Schnelker Marine jersey and shirt on Aaron Krider and Bob Bruick (right) looks perfect with the backdrop. 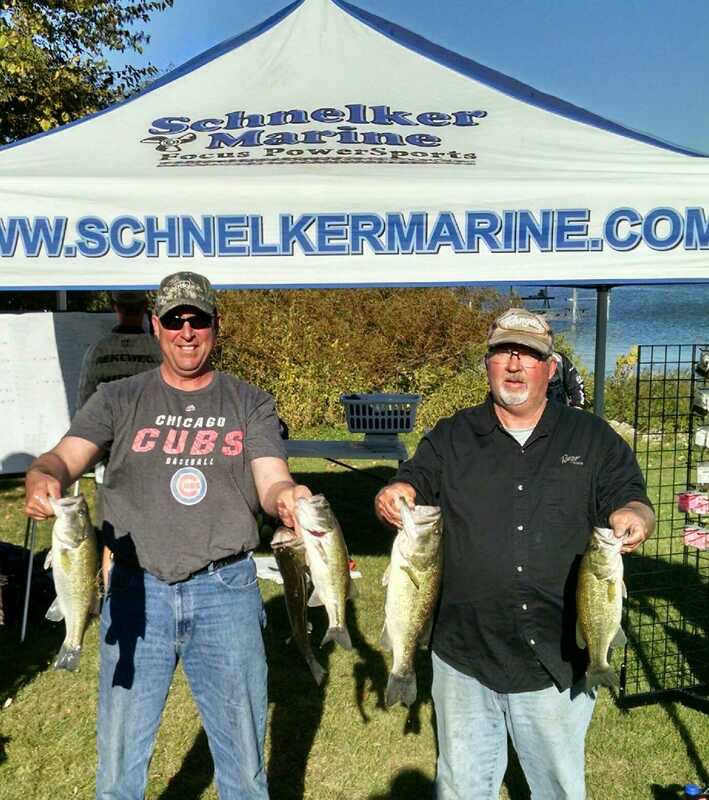 Their 7.82 pounds scored them $266, but they also had the heaviest fish of the tournament, a 4.89 pound largemouth for another cool $500.